To Be a San Francisco Hero! Join the SF Heroes LIVE Game! Join your friends and San Francisco neighbors for SF Heroes LIVE (October 11 – 18), San Francisco’s emergency preparedness iPhone and Android app brought to… life! The SF Heroes LIVE game is a live action and in-person version of SF Heroes, the smart phone preparedness social gaming app brought to you by the San Francisco Department of Emergency Management. Get a group of friends together as a team or play individually to complete in fun and creative challenges and tasks that will help you to get prepared for just about any kind of emergency. Starting October 11, begin a week-long quest to earn points as you complete tasks and compete for prizes that will enhance your superhero emergency preparedness knowledge and skills. Share your successes with your friends on your favorite social media channels. And, on the evening of October 18, join us at Jillian’s at the Metreon for an exciting celebration of your preparedness prowess with other players from the game. 1. 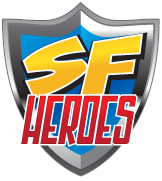 Download the SF Heroes app to your phone. 2. Choose your superhero identity. 3. Go to www.sfheroes.com and follow the links to register yourself and/or your team for the live game. 4. Invite your friends on Facebook to join the superhero ranks through the SFHeroes app. 5. On October 11, get ready to play and get prepared! Be part of the SF Heroes experience and help our city to be ready for…anything. Did you participate in the game? If so, join us on October 18th for the SF Heroes LIVE culminating event at Jillians @ the Metreon (http://www.jillianssf.com/) in San Francisco. We'd love to see your inner super heroes, some come dressed in your superhero garb!